Baguettes, coats, bags of onions, wicker hampers, a double-headed broom, a picture book, coffee cups and saucers, spoons, plastic funnels, cardboard boxes – everything can be juggled, everything will be juggled in Les Apostrophés' lengthy and exhaustively inventive Cabaret Désemboîté. 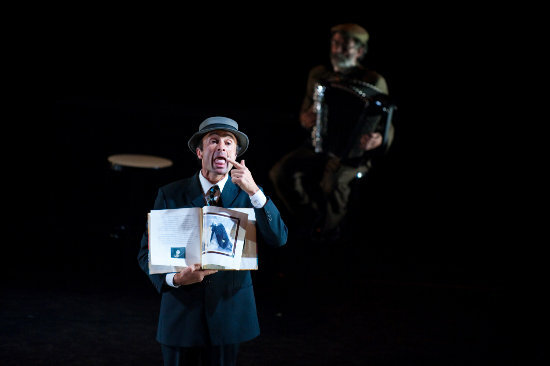 Essentially it's three productions stuck together, the beginning and end pieces taken from the company's street shows, and the middle section given over to guesting Apostrophé Jörg Müller, who reprises his older solo pieces exploring planar juggling – les tubes and mobile – in a piece of sly self-parody that replaces the original chimes with baguettes suspended on wires. It's the most successful of the cabaret's turns (and, tellingly, the only one developed as indoor performance), Müller nudging the baguettes into a miniature carousel, sticks following each other closely and cutely like ducklings in a line – then working in increasingly complex patterns, widening the arc of the circles and hurling baguettes side-on to whip through a gauntlet of spinning bread and wire (the audience gasp). It's very funny, very clever, quite surreal. Elsewhere the material is skilfully performed, old-fashioned, charming, but always it feels like the stage isn't Les Apostrophés' natural home. They've got their shtick locked down: there's a guy who took the Getting Stuck to Things module at clown school; they know how to get a laugh from a plank of wood carried carelessly on the shoulder of a distracted man; there are many variations on the classic joke of one clown undoing the work of another; Bill Oddie – wait, sorry, Marcel Dreux – is there to support on accordion. It's clear they would rule the street. In the large, front-on Chapiteau IUFM, which is sort of the Udderbelly of Festival Circa, their simple, human-scale tricks lose most of their effect, and they've been tempted to too great a length. But really: catch them on the street. Les Apostrophés are one of the companies featured on the double-DVD compilation Le Nuancier du Cirque.